Editor’s note: This post continues our weekly primer in SEO, touching on all of the foundational aspects. 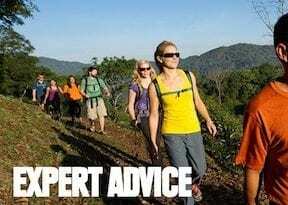 In the end, you’ll be able to practice SEO more confidently and converse about its challenges and opportunities. Keyword research lays the groundwork for all content activities in search marketing. Before I can review how to analyze keyword data, however, I’ll address, in this post, some of the reasons why it’s so critical to your business and where to obtain it. And, yes, which keywords and themes to include in the content on your site. How much does your company spend on customer research? How often do you lament the lack of information you have on a certain topic or customer desire? Do your customer research reports lead to even more questions that you wish you could answer? Keyword research can help. Keyword research involves collecting information to understand how consumers actually use search engines to fill a need. Searchers may be deciding which product to purchase, seeking information on how to use something they already own, planning a vacation, or just killing time looking at pictures of cats and unicorns. Search engines provide searchers with an easy way to find anything they want. Keyword research aggregates actual words that consumers use on search engines to fill a need. That aggregated data offers marketers a gold mine of information — essentially a window into the desires of the searching masses. Mining keyword data and analyzing it to tease out the trends that help us understand searchers’ desires is what keyword research is all about. Keyword data consists of a word and its numeric value, as shown below. Keyword research consists of a keyword and the number of times in an average month for which it was searched. 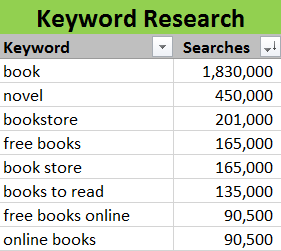 The example above looks at how many times per month real people search for keywords including the word “book.” In this instance, the keyword tool pairs up a specific keyword theme, such as “books to read,” with the number of times per month on average that the keyword theme was searched upon in the last year. Here we see that 135,000 searches were conducted for “books to read” in an average month on Google (the source of the dataset). Additional data may accompany the core keywords and values, but all keyword research includes those two components. Modern keyword research tools organize their data by keyword themes as opposed to individual keywords. The number of searches for the keyword theme “book,” for example, also contains the number of searches for the plural form “books,” as well as any popular misspellings or phrasings. That’s why the image above shows the word “book” but not “books,” the plural form. However, the keyword theme for “book” in that example does not aggregate the searches for all of the other keywords shown in this dataset. That means that the 90,500 searches for “online books” are not included in the 1,830,000 searches for “book.” They are unique keyword themes that reflect a separate set of searchers and their desires. Search engines have moved beyond a slavish dedication to individual, exact keywords as they come closer to understanding the nuances of human speech and the meaning behind words. Keyword-research mirrors that evolution to some extent, merging data from variations in spelling and phrasing into a single keyword theme. Search engines have moved beyond a slavish dedication to individual exact keywords as they come closer and closer to understanding the nuances of human speech and the meaning behind words. Years ago, a search-engine-optimization professional might have recommended using different variations of plurals or spellings in content optimization, in an effort to rank and drive traffic for those unique keywords. Most keyword research is based on data provided by Google Keyword Planner, a tool that Google provides to AdWords customers. The Keyword Planner is also very useful for SEO, and has the added benefits of being free and representing roughly 80 percent of all searches in the U.S. Still, like all datasets, the Keyword Planner has its limitations. It’s always important to take these limitations into account when analyzing data to understand the biases and inaccuracies your data will include. Keyword Planner data includes only Google searches, and represents a single month averaged from the last 12 months. Google does this to remove seasonality, but that means, depending on the season, there may be fewer or more searches than the average number shown. In addition, all keyword data is rounded off and generalized. And unless you have access to an account that’s tied to an AdWords spend of sufficient size, your data will be generalized into buckets based on the number of searches, such as 10 – 100, 100 – 1,000, 1,000 – 10,000, and so on. As a result, while keyword research is foundational to SEO and all of search marketing, it’s important to take the data as directional rather than as absolutely accurate numbers. You will likely receive more searches by targeting highly popular and relevant keyword themes than by targeting less popular ones. Bing also has a free keyword tool, but its dataset is much smaller since it represents a smaller percentage of the searches conducted each month. Many of the major search-marketing platforms, such as BrightEdge, Searchmetrics, Conductor, and Rio, also include keyword research functionality. Their data comes from the Google Keyword Planner API, though they may use additional proprietary calculations. Purchasing a license to these platforms is a way to get more accurate keyword data without having access to a Google AdWords account, but the cost is prohibitive if all you really want is keywords, as the platforms also include error checking and recommendations, natural search tracking, predictive modeling, and more. Standalone keyword tools include WordStream, MOZ Keyword Explorer, and SEO Book’s keyword tool. All offer free versions and less expensive paid versions than the larger platforms. Make sure to read about any tool’s data sources and biases before relying on it, however. Avoid a tool if it doesn’t sufficiently disclose this info. My installment next week will continue to address keyword data, from how to plan and gather keywords, to analyzing and apply them. 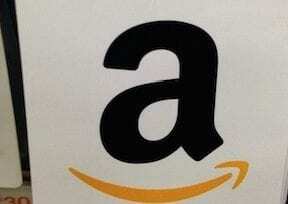 For Merchants, How to Navigate Amazon’s Marketplace?